The West Highland Terrier may look like a cuddly stuffed animal, but underneath that white coat, he's generally more dog than many people are prepared to handle. The West Highland White Terrier is a bold and energetic little dog that has absolutely no idea of his true size. In his mind, he is equal to the Great Dane, and twice as handsome! The breed was developed in Scotland and largely gained its characteristics due to the efforts of two key breeders: Colonel Edward Donald Malcolm and George Campbell, the eighth Duke of Argyll. These two gentlemen used the occasional white pups thrown by Scottish and Cairn Terriers as their main foundation stock; bringing in a few other terrier breeds as needed to establish the desired qualities. The West Highland Terrier is solid white in color, bred to be easily distinguished from prey in the field. He stands approximately eleven inches tall at the withers, with pricked ears and tail held alert. Most specimens weigh in between fifteen and twenty-two pounds.Westies, as they are nicknamed, carry double coats of hard hair on top and soft, thick fur underneath. Although they do shed, you'll find much less loose hair around the house from this breed than many others. In fact, many veterinarians consider the West Highland Terrier to be almost hypo-allergenic. This may make the breed a fair companion for people who suffer from mild asthma and other allergies, but a physician's recommendation should be sought first before bringing one home. The little Westie is a BIG character. He loves his two-legged companions and is generally willing to please them, as long as he thinks it's a good idea. This is why this is not the breed for every home. A Westie is perfectly capable of thinking for himself, and frankly, he may not always agree with what you see as the proper course of action. The West Highland Terrier must be dealt with firmly, but lovingly. He resents being bullied and will not respond to it willingly. In fact, pushing a Westie too far can result in the occasional nip; so many experienced breeders recommend these dogs only be placed in homes with older children or no children at all. To be fair, these dogs were bred for tenacity, a characteristic that works to their advantage in the field as they plow underground in chase of small game. This brings us to another point: Westies like to dig. Although some enjoy this pastime much more than others, it can become a problem for owners as their pets dig under fences to go have a romp on their own. Since Westies cannot be coerced, you must train them with positive reinforcement, and begin when they are very young and far more compliant than they will be as adults. All obedience training must be turned into a fun activity for these dogs, or else they quickly become bored and unresponsive. Clicker training is another effective method of teaching that brings dogs immediate rewards for desirable behaviors. On the bright side, even though most terriers are notorious for marking their territory, a Westie usually house trains quite easily if he has been raised in a clean environment from puppyhood. Spaying or neutering between four and six months of age will also pre-empt this and other unwanted sexual behaviors. The West Highland Terrier does not produce an abundance of coat oil, so he shouldn't be bathed too frequently or his skin will become dry and irritated. A monthly bath, frequent brushing and a teaspoon of high grade cod liver oil in his food once in a while should keep his skin and coat in tip-top shape. Additionally, you can have your pet trimmed every few months to keep him from getting too shaggy. If your dog is getting all the exercise he requires, his nails will generally wear down on their own; but inspect them every now and then and trim as needed. Ears should be swabbed out on a weekly basis to remove waxy build up. On average, West Highland Terriers live to be a good fifteen years old, but there are a few health concerns found in the breed. 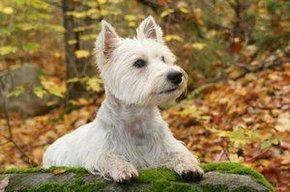 The West Highland Terrier looks like an easy customer, but this is not the dog for an inexperienced or sedentary owner. A Westie has a lot of energy and plenty of ideas how to use it, so you have to be on the ball to keep up with him. Yes, he can be a wonderful cuddler, but when he's ready to run he'll go whether you want to come with him or not. Be very certain you want this much dog before you take one on.